← Knitter’s Frolic in TWO days! We are excited to present a series of guest bloggers to the Soakworthy space. They will be posting on all sorts of topics, from Lingerie design and production, to knitting and sewing as art. We look forward to expanding our idea of what is Soakworthy. As usual, the opinions expressed are those of their author, and do not necessarily reflect the opinions of Soak Wash Inc, but we probably think that they are making an excellent point. Enjoy! Hello! My name is Megan Kreiner and I am the author of “Crochet A Zoo”. If you’ve ever delved into wild and cute world of crochet or knitted toy making, then you’ve probably given at least one or two of your creations away as gifts. 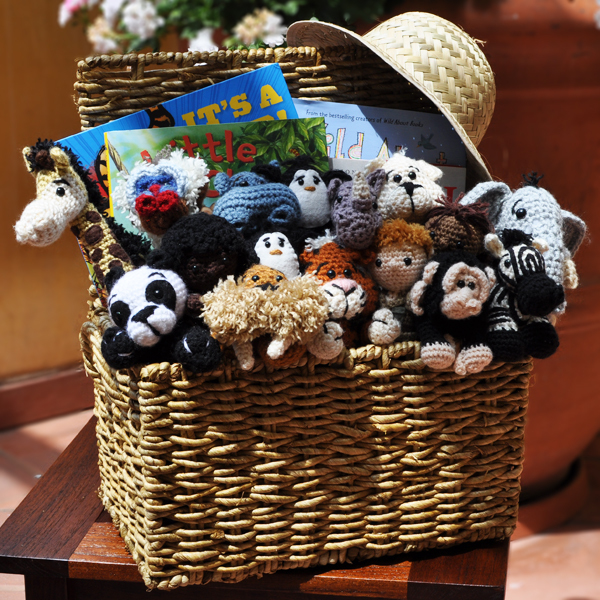 In this post, I thought it would be fun to talk about using the toys in the “Crochet a Zoo” book in gift baskets! The sky is really the limit when it comes to putting a perfect gift together and I hope that these 3 gift baskets might inspire you to mix and match toys along with other wonderful extras to make the perfect gift for any occasion! – A variety of yarn skeins ~ 110-125 yards is more than enough to make 1 crochet animal. – Felt for patches, stripes and spots. – A full set of crochet hooks ~ I love the Amour Crochet Hook Set from Clover! – A bag of toy stuffing ~ I padded the bottom of the basket with the stuffing. – The book “Crochet A Zoo” ~ there’s a great “basics” section in the beginning. – A few bottles of Soak to keep critters made with delicate yarns nice and clean. – A small notions bag with tapestry needles, stitch markers, row counter, a pack of 9mm-10mm plastic safety eyes, an automatic pencil, post-its, marking pins, sewing needles,and thread ~ this can be tucked inside the basket with the stuffing. – A few finished animals from Crochet a Zoo for inspiration! I recommend using a fabric or fabric lined basket for this gift basket to keep the yarn from snagging. You can also pack up these goodies in a large canvas bag instead of a basket so your new crocheter can travel with their projects. – A selection of animal themed clothing ~ Check out the “Safari Animals” collection from the Janie and Jack online shop or retail store featuring elephants, rhinoceros, giraffes and zebras! – A set of new shoes wrapped with a bow ~ also from Janie and Jack. – A selection of crochet toys to complement the clothing you’ve selected. – A few bottles of SOAK for handwashing baby delicates! For baby toys, I recommend using french knots instead of plastic safety eyes in my book. I also recommend being selective about the yarns you choose to make your toys with as some babies may be allergic to wool. Fortunately, there are many wonderful options now in organic cotton yarns. You can even order organic stuffings as well from online shops like NearSea Naturals. 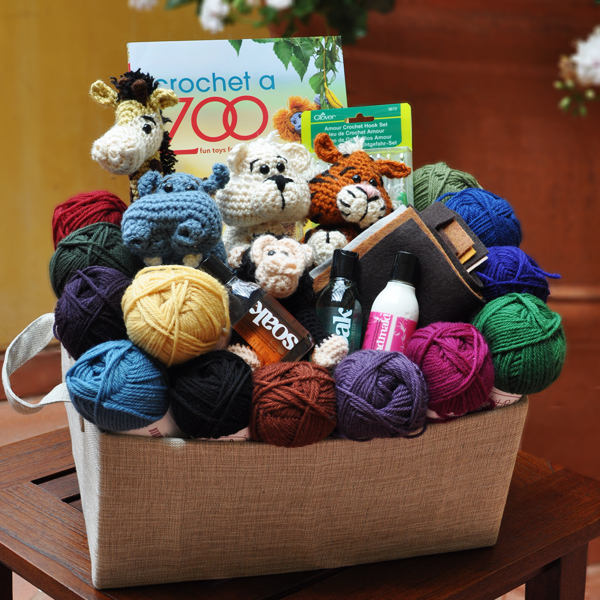 – As many crochet zoo animals (and zoo keepers) as you can fit! – A child sized pith helmet (available on Amazon.com). – A selection of your favorite animal themed books. If you’re feeling particularly inspired, you can also add additional pieces to your zoo keepers ensemble like a vest and binoculars. Choosing a basket with a lid can also be a good choice in helping to keep an unruly pack of animals neat and tidy. I hope that these 3 baskets will inspire you to try out new ideas when gifting your handmade toys! They can be as fun to put together as they are to receive! * Looking for even more animal patterns, links to resources, or signed copies of the Crochet a Zoo book? Check out www.mkcrochet.com for more information! Love seeing Meagan’s imaginative crocheted critters!